So last week it was reported that a serious vulnerability was discovered in Bash (Bourne-Again SHell) which is pretty much core to a lot of Linux/Unix OSes – including Apple’s MacOS. The bug, dubbed Shellshock, is supposed to be more serious than the previous OpenSSL Heartbleed vulnerability that was discovered earlier this year. It allows hackers to remotely take control of any system running Bash! VMware have now released a KB that explains which hypervisors are affected by Shellshock. Thankfully only the really old versions of vSphere ESX are affected…..
ESXi 4.0, 4.1, 5.0, 5.1, and 5.5 are not affected because these versions use the Ash shell (through busybox), which is not affected by the vulnerability reported for the Bash shell. ESX 4.0 and 4.1 have a vulnerable version of the Bash shell. Given how serious this vulnerability is, VMware are actually going to roll out a security patch for ESX 4.0 and 4.1 even though they are out of general support. It is also worth noting that all VMware products currently shipped as a virtual appliance (usually a SLES VM) have the affected version of Bash installed. These virtual appliances will be updated in the near future. I would recommend all VMware customers to keep an eye out for updates that will address the Shellshock vulnerability! Upon upgrading SRM from 5.5 to 5.8 and vRA from 5.5 to 5.8 (I’m using vSphere replication with SRM in my demo environment), I noticed that the usual process of upgrading the vRA from the admin page doesn’t work if you point it at the online repository! From the Release Notes, it turns out that the downloadable ISO image is the only means of upgrading from vRA 5.5.x or 5.6 to 5.8! NOTE: Ensure you follow the VMware Upgrade method to the DOT…….!! I pretty much had to delete the vRA and install a brand new one and I’m still none the wiser as to what went wrong during the upgrade!! Download the vRA 5.8 ISO image and copy the ISO file to a datastore that is accessible from the vCenter Server where your vRA is currently deployed. In Web Client, right-click the vSphere Replication virtual machine and select Edit Settings. In Virtual Hardware, select CD/DVD Drive > Datastore ISO File. Navigate to the ISO image in the datastore. For File Type, select ISO Image and click OK. Check the box to connect at power on and follow the prompts to add the CD/DVD Drive to the vSphere Replication virtual machine. 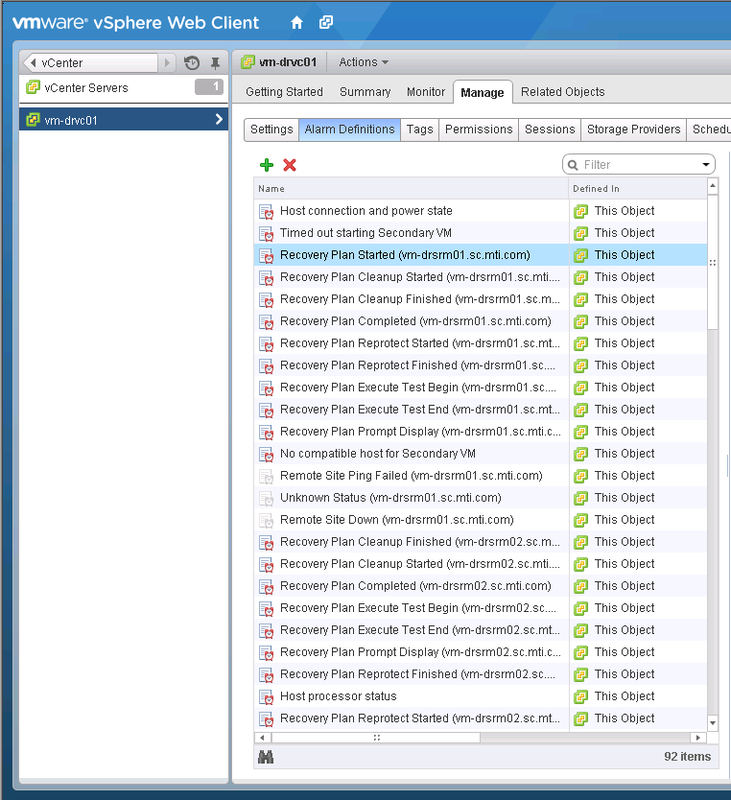 Restart the vSphere Replication virtual machine. In a Web browser, log in to the virtual appliance management interface (VAMI). 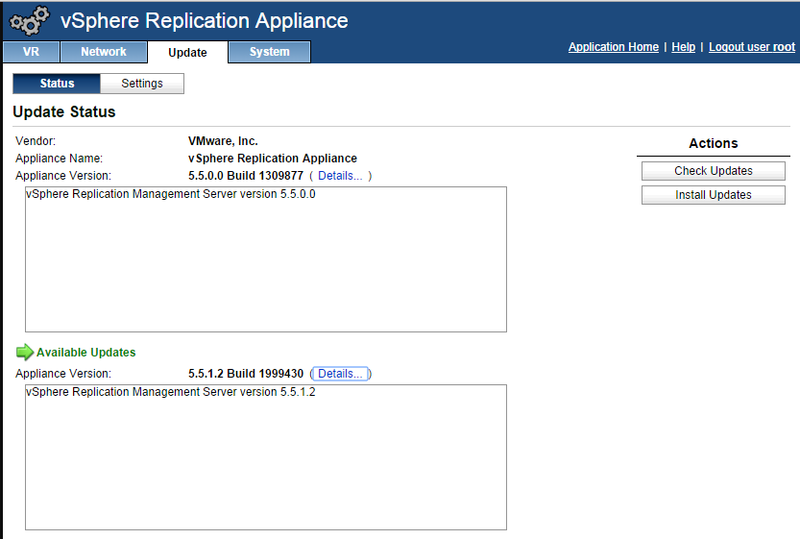 If you are updating vSphere Replication 5.1+, go to https://vr_appliance_address:5480. Click Settings and select Use CDROM Updates, then click Save Settings. Click Status and click Check Updates. The appliance version appears in the list of available updates. Click Install Updates and click OK.
After the updates install, click the System tab and click Reboot to complete the upgrade. Log out of the vSphere Web Client, clear the browser cache, and log in again to see the upgraded appliance. Once you’ve upgraded the vRA to 5.8, you can now go ahead and upgrade your SRM server to 5.8…… simply run the SRM installer and follow the installation wizard! BIG WARNING HERE: As soon as you upgrade your SRM to 5.8, you can only manage it via the Web Client…..!!! And it is completely re-written……. took me a while to work out where all the settings were located! 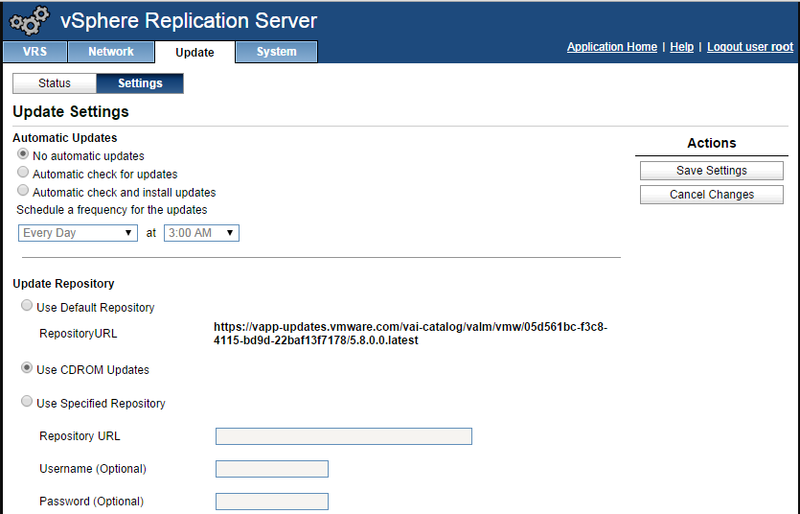 Same with vRA 5.8, you can’t set replication within the old vSphere client. vCenter Server can now also support Oracle 12c, Microsoft SQL Server 2012 SP1 and Microsoft SQL Server 2014. There’s also a new ‘container’ within the Web client home page that allows you to integrate with vCHS (or vCloud Air as it’s now called). The other bit of big news if that the vSphere client no longer supports Windows XP or Vista…. which means those of you still running those archaic operating systems need to update! So during a recent deployment of vCenter Operations Manager (5.8.2) at a customer site I encountered the following error whilst trying to pair the vCOPs vApp to their vCenter Server. This was the first time I had encountered this issue deploying vCOPs, fortunately given how much exposure I got to SSL certifications during a previous project I knew it could be down to one of 2 things….. either the SSL certificate had expired, or that it was not generated with the correct parameters. 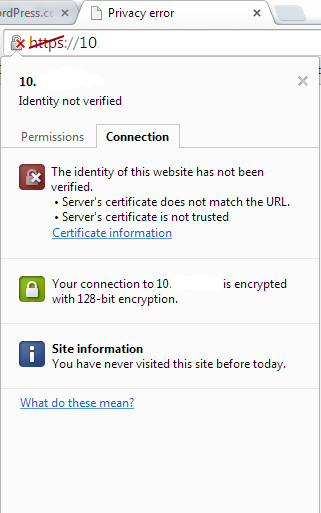 Note: Quickest way to look at a vCenter Server’s SSL certificate is to just open a browser and point it at the vCenter’s IP address, then view the certificate…..
or if it’s a Windows deployment of vCenter 4.1 or later, you can find the certificate here: C:\ProgramData\VMware\VMware VirtualCenter\SSL\rui.crt (Note that c:\ProgramData is a hidden folder!). It seemed that the SSL certificate was valid (expiry date was 2022), however I noticed that the public key certificate was weak as the key length was only 512 bits!! What had happened was a previous partner had upgraded them from VI3.5 to vSphere 4.0 to vSphere 5.0 and had forgotten to re-generate the SSL certificates! 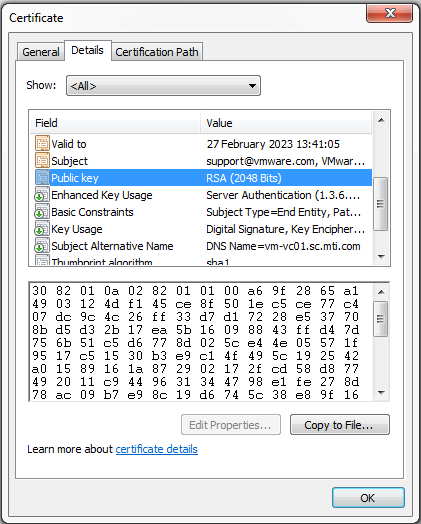 Prior to vCenter Server 4.1, by default VMware self-signed their SSL certificates with a public key length of 512 bits! 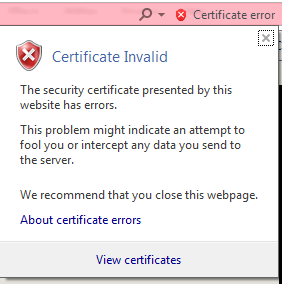 So when they upgraded they kept the same SSL certificates. Post vCenter Server 4.1, if you installed from scratch the public key length is set to RSA 2048 bits by default. So because the public key length was only 512 bits, vCOPs could not authenticate the vCenter Servers’ certificate (I believe it has to be a minimum of 1024 bits)! 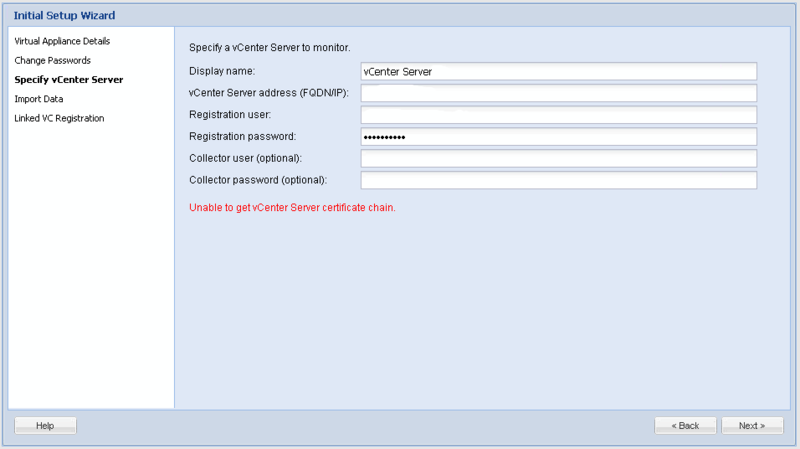 Copy the rui.crt file (the SSL certificate) on the vCenter Server into the tmp drive of the vCOPs UI VM. (This can be easily achieved using WinSCP). Login to the console of the UI VM as root. Restart all services with the su – admin -c “vcops-admin restart” command, or reboot the vApp from the vCOPs admin page. Once the SSL certificate was injected into the vCOPs VMs keystore it was plain sailing and we could continue with the setup wizard.